Every engagement ring should be truly unique and represent the journey you and your partner have taken together and the exciting road ahead. At Odyssey Jewellery Designers lnc., we’ve been helping newlyweds in Richmond Hill and Toronto create beautiful custom engagement ring designs to tell their individual tale of devotion and love. With over 60 years of custom jewellery design experience, our talented team will walk you through the entire engagement ring purchasing process. Let’s face it, shopping for that perfect engagement ring can be stressful^ There are so many choices and after a few visits to jewellery stores, the choices can seem overwhelming. Every person has their own unique tastes and budgets. Working with a custom engagement ring designer is an excellent option for many engaged couples. Your own style and preferences are transformed into your engagement ring. A well-designed custom engagement ring will symbolize your relationship, your love, affection, and future. Engagement rings are made to last the test of time and will serve as a family heirloom for the many years and decades that follow your proposal. Many engagement rings are eventually handed down from generation to generation, providing an immortal footprint of the love you share with your future spouse. The process of creating a custom design engagement ring begins with an idea. We take a lot of pride in our ability to create unique engagement ring designs with our customers. Our team of experienced jewellery designers will partner with you to create a beautiful ring design that is unique to you and built to last with the finest materials. Many couples want a diamond engagement ring, we’ll work with you to navigate the many options and find you something that’s perfect for you and your budget. A round brilliant cut diamond is one of the most common custom engagement ring designs in our jewellery factory. We can enhance the centre diamond in many ways to make it unique and individualized. Double Band – Looking for an engagement ring that instantly projects an image of style, luxury and beauty? A double band might be the perfect engagement ring for you. The diamond coupled with the double band shank provides an excellent way to show off your diamond. Radiant Cut – Cut with angled corners and facet patterns, a radiant cut is an excellent option for many engagement ring shoppers. Known for their ability to sparkle, this diamond cut is great for really showing the character of your diamond. Halo – This ring setting is meant to sunrround your centre diamond with diamonds. Many of our customers are delighted to see the end result of a halo engagement ring. There are a wide range of stones that can be used to add an extra layer of customization to your engagement ring. Solitaire – Built with beauty and simplicity in mind, a solitaire settinE allows the focus of your ring to land directly on the diamond. These rings are designed with simplicity and elegance in mind. 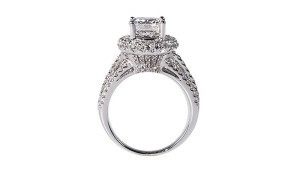 At Odyssey Jewellery Designers we create affordable engagement ring pricing. Our experienced team of jewellery designers will work with you to create a beautiful engagement ring that works with your budget. There are many customizations that can be made to make both your loved one and bank account happy. It’s important to plan ahead when having a custom engagement ring designed. Remember, the ring is being specially created for you and it will take some time to make. Every ring design is unique and time frames will vary from customer to customer. 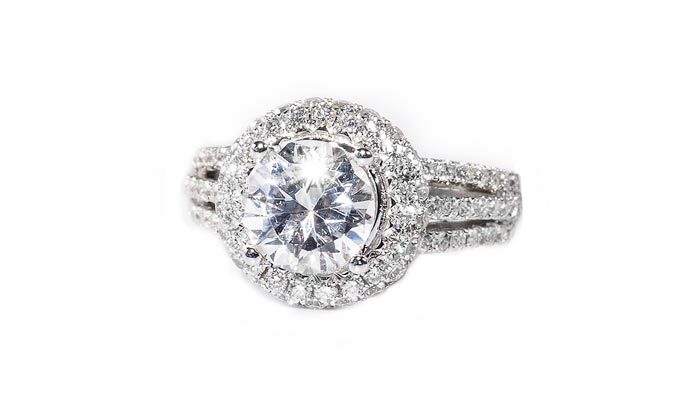 An experienced designer will ask the right questions to fully understand how your engagement ring should be designed. Not interested in a custom designed ring? We also have an extensive selection of engagement rings in our showroom. We can also repair, clean and resize an engagement ring you already own. We are able to provide exceptional service for the couple purchasing an engagement ring together or more traditional customers who want to shop alone. When shopping alone, pay attention to your partner’s jewellery preferences and style. Sometimes it helps to enlist the services of a best friend or close family member of your future fiance to make this job much easier. Our jewellery store has built a reputation for providing exceptional service, craftsmanship and high-quality. We understand that an engagement ring is a lifelong investment and we work hard to exceed each of our customers expectations on every engagement ring we create and sell. With over 60 years of experience designing custom engagement rings, we are ready to help with your big moment. We are a full jewellery design factory and all work is done right on premises. Discover how we can bring your love story to life and help you create a perfect engagement ring that reflects the love and future the two of you share. Speak to one of our experienced engagement ring designers to get started. Each piece of custom jewellery we design begins with a story. From start to finish, our goal is always to bring your story to life through the jewellery we create. At Odyssey Jewellery Designers Inc., we’ve been helping our customers tell their stories for over 60 years with our custom designed jewe1lery. Our goal is to work with you to design something that will leave you or loved one speechless when it’s seen for the first time. We love hearing expressions such as amazing, stunning, incredible and perfect. We’ve built our reputation on being able to deliver these reactions time after time. Over the years we’ve had a lot of conversations with our customers that begin with, ‘I’m not sure if you can do this, but I have always imaged ..,.’. We love exceeding the expectations of our customers each and every time. Birthdays, anniversaries and of course…. taking that next step with the person you love, a ring is an important symbol for many life’s events. We are able to create anything you can imagine in a custom designed ring, in our Richmond Hill factory. Our goal is to come up with a design that instantly tells your story with a ring made of the highest quality materials. Our experienced ring designers are able to work with many styles and can create beautiful rings for both women and men. During our planning process, we’ll gain a strong understanding of your design goals and budget and will design a ring that works accordingly. We carry a wide range of engagement rings, diamond rings, and custom designed men rings. Everyone loves a nice pair of ea:rings. Statistically speaking, earrings are one of the most commonly worn jewellery items in the world. At Odyssey Jewellery Designers, we have a wide variety of earrings to choose from including diamond and gemstone earrings, hoop earrings and various other earring designs. Our experienced jewellery designers want to give you the earrings of your dreams. A well-designed bracelet is a great way to express individual style and fashion. )lour wrists are a focal point of many every day moments such as a handshake or a wave. A bracelet can actually say a lot about you. That’s why our custom bracelet designers work hard to build a bracelet that you’re proud to show off. We have a great selection of bracelets made of materials such as diamonds, sapphires, coloured stones and various other materials. All bracelets are built with quality and longevity in mind. We work with you to design something custom made for you or your loved one’s tastes. Please stop by our showroom if you have something specific in mind. Necklaces and pendants are very popular jewellery items used as gifts for any occasion, Christmas, an anniversary, birthday or just because you want to show you care. A diamond pendant is a beautiful and memorable gift. Our necklaces and pendants are made of high quality materials such as diamonds, precious and semiprecious gemstones. Odyssey Jewellery Designers Inc. offers a legacy of unparalleled craftsmanship, originality, and quality. With over 60 years of experience in the jewellery industry Odyssey has a full factory and all work is done right on the premises. We take pride of your piece of jewellery from start to finish. You should have high expectations when it comes to your custom made jewellery and nothing leaves our factory unless it is perfection! At Odyssey Jewellery Designers Inc. we provide full-service jewellery repair for people living in Richmond Hill, Markham, Vaughan and Toronto. Our experienced team of jewellery repair professionals are true masters of their craft and will treat your jewellery as their own. We are proud to provide the finest jewellery repair services in Toronto and we make it our goal to exceed the expectations of our customers with every job we do. We utilize the best of old world traditional jewellery repair methods with modern technology. Our skilled jewellery repair professionals will treat your jewellery with the respect it deserves. We’ve built our reputation on high-quality work and attention to detail. Our team can repair a wide range of jewellery including chain and bracelet repair, rings and ring sizing, diamond setting, earring repair, engraving, watch repairs and many other jewellery repair services. Every jewellery repair job we do is done on-premise, you can be assured that your jewellery is not being moved around or handled by strangers. Your jewellery will not leave our shop until it’s time to pick it up. We also take pride in delivering both high-quality jewellery repair services and affordable prices. Do you have a ring, necklace or bracelet that needs repair? Our jewellery repair team can inspect and repair any broken ring, chain, pendant, bracelet or charm. Also, we can shorten and lengthen the size of your ring, bracelet or necklace. Many jewellery repair jobs require soldering and it’s important to find someone with experience to ensure the broken spots are undetectable. We’re also experienced at fixing broken clasps on jewellery. Have a ring that doesn’t fit just right? Whether it’s too tight, too loose we can help. We have all your ring resizing needs covered and we can work with rings of all materials. Many ring adjustments can be completed while you wait. We’ve been doing jewellery repair in Richmond Hill for 60 years and we’ve seen a lot of pieces over the years. Your jewellery is both important and valuable and it deserves the best treatment. Let us keep your jewellery looking great for years to come by stopping by our store at 10909 Yonge Street Unit #55, or by calling 905-737-5266. Life is full of beautiful moments and oftentimes jewellery plays a key role in providing lifetime pieces for these occasions. With 60 years of experience serving the jewellery needs of Richmond Hill, Markham, Vaughan and throughout the Greater Toronto Region, we know how to exceed our customer’s expectations on each visit. It begins with attention to detail throughout the entire process. We’re proud that all of our jewellery is made in-house with our talented and experienced jewellery designers. This allows us the ability to ensure that everything we sell is of the highest quality and built with the knowledge of what our customers expect. We have also earned a reputation for importing the highest of quality jewellery pieces. Being custom jewellery designers lets us work directly with our customers to create something that elegantly tells their unique story. 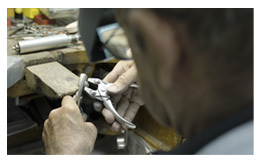 We work with people hands on to create beautifully handcrafted custom jewellery. Regardless of the budget, we ensure top quality for all of our jewellery. At Odyssey Jewellery Designers Inc. we bring attention to detail to each of our unique jewellery designs. Purchasing jewellery is an investment and we offer some of Toronto’s most affordable jewellery prices. With this focus on value and quality, it’s not a surprise that we’re now being routinely visited not only by long-time regular customers but by second and third generation customers. We offer a wide range of jewellery designs in stock and we offer full jewellery and watch repair services. Popular jewellery pieces in our Richmond Hill jewellery store include engagement rings, diamond rings, bracelets, necklaces and pendants and earrings. We offer a great selection to suit the needs of both women and men. Odyssey Jewellery Designers Inc. has seen a lot of changes in the last 60 years, but our philosophy hasn’t shifted. People deserve the highest quality of jewellery with unparalleled service and guidance. We take our work seriously and we take a lot of pride in being a part of the celebration of life’s happiest events. Whether you’re looking for an engagement ring to welcome a new chapter in your life or a new pair earrings to match a dress for an upcoming event, we have the jewellery you’re looking for and we look forward to helping through the entire design and buying process. © 2016 Odyssey Jewellery Designers Inc.